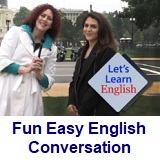 ﻿ Fun Easy English - new classroom free online classes english language lessons speaking listening writing reading january 6. 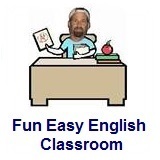 Today in the Fun Easy English classroom you will decide what you hate the most about English. Many people study for their careers or English class while others study to travel abroad. After studying English for awhile, most students find something they really hate about the language. What do you hate the most about English? Hi. In the classroom today you will decide what you hate the most about the English language. People study English for many different reasons. Many people study for their careers or English class while others study to travel abroad. Still other people study simply for fun or because they want to understand English movies, television, or radio. After studying English for awhile, most students find something they really hate about the language. Some students hate grammar or pronunciation, while others hate idioms, slang, or even conversation. English can be really difficult but in time you can be proficient if you keep studying. From YOUR Teacher: What do I HATE the most about English? Definitely grammar. English grammar has many rules and just as many exceptions to those rules. English grammar is very difficult to learn and to teach. In addition, many students use perfect English grammar when speaking and sound very unnatural. Even though English grammar is difficult to learn, it is really important for students to know and understand English grammar rules and exceptions to those rules. It is the base from which you can build and become the master of the English language. 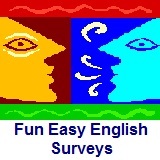 Survey: What do you HATE the most about English? Conversation Lesson 6 - Where Is the Gym?